J. C. Wilson & Co. Limited was a Montreal-based maker of paper goods. Between 1897 and 1902, the company printed a series of patriotic postcards and envelopes to “show the patriotic feeling of the colonies towards the mother country” and notably with a theme of “Anglo-Saxon unity” among Canada, the U.K. and the U.S.A. This theme of solidarity among English-speaking peoples was popular in the era of the Spanish-American War and the Boer War, each of which is referenced on J. C. Wilson postcards. The company was named for its Irish-born founder, James Crockett Wilson (1841-1899), who in addition to being a leading man of business was also a Montreal city councillor and, from 1887-1891, the Conservative MP for Argenteuil. The facade of the Wilson Building at 380 St-Antoine St. W. has been preserved as part of a new development in downtown Montreal. J. C. Wilson & Co. was the first Canadian publisher to create a series of patriotic postcards and envelopes that were widely distributed and which received wide public use, at a point when Canadian spirits were running high, first with Queen Victoria’s Diamond Jubilee in 1897, and soon after with references to other themes of the day, leading up to and including the Second Anglo-Boer War of 1899 through 1902. Have a look at one of the highlights of the jcwilson.ca collection, the Boer War Usages of J.C. Wilson patriotics. The company also went on to create a second series of postcards and envelopes with their Sports & Pastimes of Canada series. 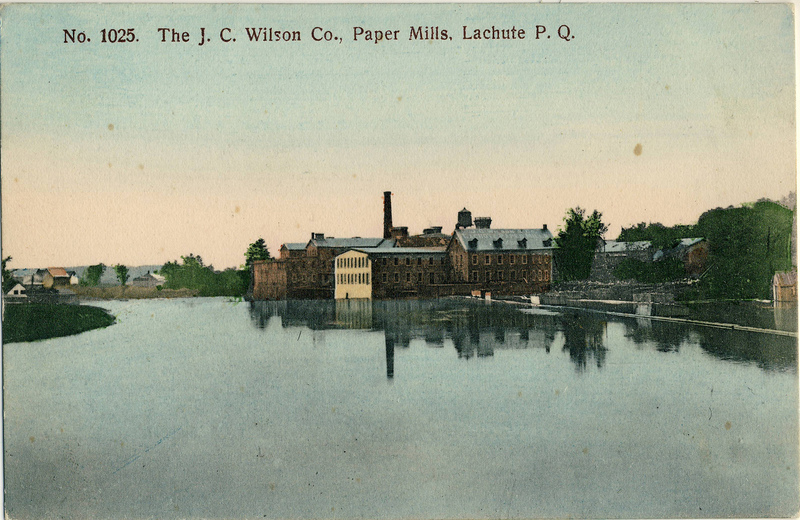 J. C. Wilson & Co. was recognized as one of the first colonial firms to produce postcards commercially. In the inaugural (July 1900) number of The Picture Postcard, the first British publication devoted to postcard collecting, the company’s success was specifically noted (and said to have necessitated the opening of an office in London). Moreover, an unused example of “The Flag that Braved” (see illustration above) had the honour of being the very first postcard to appear as an illustration in that début issue. According to Joseph Graham, “James Crockett Wilson was born in Ireland in 1841 the son of Samuel Wilson and Elizabeth Crockett. They arrived in Montreal in the spring of 1842, five years before the beginning of the Irish potato famine.” “In 1870, he set up his own company manufacturing paper bags and is credited with making the first flat-bottomed paper bag and with being the first to supply paper bags to grocery stores in Canada. 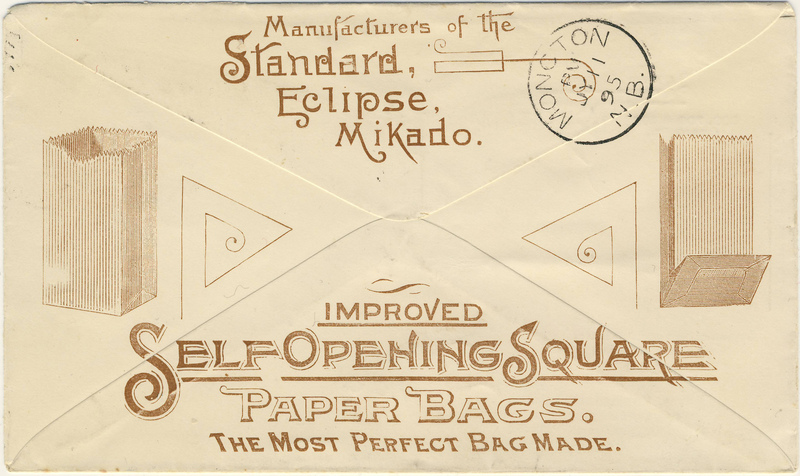 Back of a J.C. Wilson envelope, advertising the company’s line of paper bags. Further information is available in Joseph Graham’s book “Naming the Laurentians”, which makes extensive use of material from Patty Brown, the great great granddaughter of J. C. Wilson and an early member of the Toronto Postcard Club. For an extended biography of the Wilson family and their role in founding one of the largest paper companies in Canada, see the Dictionary of Canadian Biography website. Some of the material above is adapted, with permission, from the jcwilson.ca website, which contains a wealth of additional information on this important company, including many illustrations of its postcards. Error: Error validating access token: Session has expired on Friday, 12-Apr-19 20:21:58 PDT. The current time is Friday, 19-Apr-19 21:35:00 PDT.